Mintage: 262.000 coins in 1872, 1.745.000 in 1873, 3.092.500 in 1875 and 653.255 in 1876. Accordingly to monograph "Monede şi bancnote româneşti" there are pieces with sides facing either commonly (inverted) or the medal fashion (upright). The ensign of the José Allard mint in Brussell appearing on the values of 50 bani, 1 leu and 2 lei (1872 - 1876) is not a barbell, as pointed by the Romanian specific literature, yet it is a portrait. This fact is conspicuously noticeable only on perfectly preserved, mint state coins. Plane to see, the barbell description provided by specific printed numismatic materials is wrong. Of interest to see that the face or mask differs with the denomination value and the year of issue. 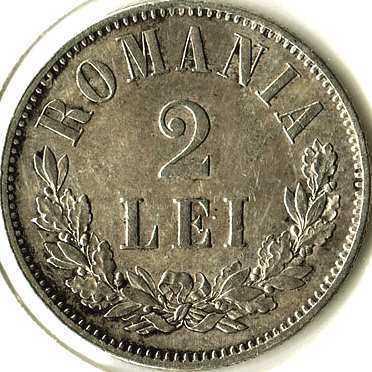 This ground shaking datum along the illustrative pictures accompanying it and the 2 lei 1873 pictures are present on Romanian coins as courtesy of Mr Radu Lissner. We also received further trustworthy info from Mr. J. M.. We quote from his letter as we cannot put it better than himself: "The mint mark on the coins, struck at Brussels between 1872 and 1876, is actually the head of Saint-Michael, patron of the city of Brussels. This mint mark was used for several centuries up to the independence of Belgium in 1830, but disappeared then from the Belgian coins, only to reappear again in the 1960s. It was, however, used on the coins struck for Romania in Brussels in 1872-1876, and on some essays of the same period made for Switzerland." 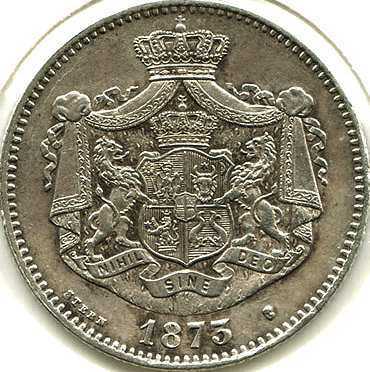 Also Mr. J. M. sent us the image of an 1872 piece without the mint ensign (below left). In the picture (above right) details on the 50 bani 1873, 2 lei 1873 and 2 lei 1876 silver pieces are displayed (from left to right for the beholder). "In December 1872, the ministry of Finances brings from Belgium, for 25 million lei, a new silver coin, all pieces of 2 lei. The newspapers criticize this transport for numerous reasons: weekly reliefed coin, ugly design and, above all, the figure of the prince that was on the old coins, dissappeared as result of Turkey's demand. Then the newspapers were asking why was the new coin cast in Belgium while the state had a well installed mint with special personnel?" Indeed, on the silver 1 leu and golden 20 lei coins of 1870 the portrait of prince Carol had been represented. The presence of the effigy was deemed by Turkey as a sign of Romania's independence tendencies. As consequence of Turkish protests, the effigy was replaced by the coat of arms or the crown of Romania.